THE ANC AND THE NATS! The widely held but false belief that the end of apartheid legislation and whites-only rule will usher in social changes that benefit the majority is beginning to shake off from the hearts and minds of the Azanian masses. It has taken two decades to wear off the mythology, with the rattling brute force of social reality waking people from slumber. Inundated with press, radio and television propaganda, the citizenry had held on to the myth of a New South Africa with less or no bloodshed of innocent people in the streets, with jobs and prosperity for all, and that at long last the yoke of racial bigotry and super exploitation will be done away with forever. Myths, as a tool of mass mobilisation, are used strategically either for good purposes or for achieving negative ends. In a political language, they may be used for revolutionary purposes or with reactionary intentions. The Azanian Tendency – made up of the Pan Africanist Congress of Azania, the Black Consciousness Movement of Azania and elements of the Unity Movement – used the country’s name change from SA to a free Azania as a driving force to address the national question and for the masses to participate and own the fight for a socialist people’s republic. The revolutionary myth of Azania is often slandered at state occasions by government leaders gleefully referring to it as a figment of the imagination. They are happy to applaud the myth of a new South Africa. 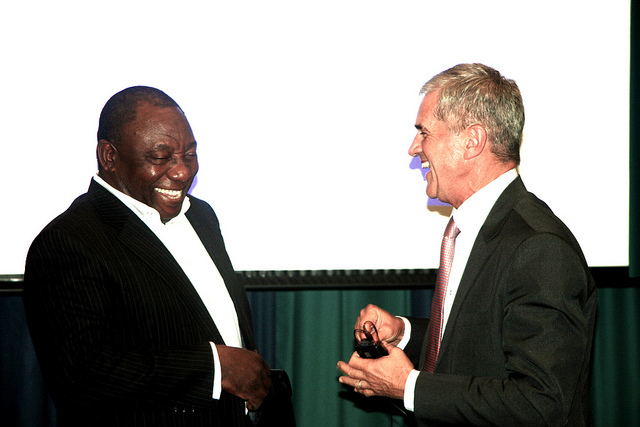 The powerful new SA mythology was built on the back of private deals made in bosberaads (bush councils) and special fishing outings set up between Roelf Meyer and Cyril Ramaphosa. Their objective was to create a new era of corporate politics wherein dominant parties would rise in power to become the new oligarchy, thus denuding mass-based and people powered politics. The duo’s principals, FW De Klerk and Nelson Mandela, were given the Nobel Peace Prize in October 1993, and received diplomatic accolades and strategic western-centred approval from powerhouses who backed their joint leadership to achieve a negotiated settlement. FW De Klerk had just approved a SADF raid on the Mthatha house of Sigqibo Mpendulu – an ex political prisoner on Robben Island and Poqo militant – where innocent teenagers were murdered through a cabinet decision. The political predicate for the new South Africa mythology was based on the idiomatic message that it was unreasonable to kill the goose that lays the golden egg; and prudent to let bygones be bygones. This message was taken hook, line and sinker by all the trusting African people. The African National Congress reasoned out that the balance of forces had reached an irreversible equilibrium. They said the enemy, represented by the National Party, had realised its weaknesses and the possibility of a scorched earth outcome if it did not seriously engage in settlement talks. They entered into bed with the Nats. These two dominant entities then formed a dance duo on the stage of the new SA myth, and went on a conspiracy to distribute state benefits between themselves, in a kind of devil’s waltz. They became friends with benefits. It now seems that the agreements made in smoke-filled rooms for the African National Congress leadership to make its boodle in the defence procurement proposals; and for the National Party to enrich itself from cash piles stolen from the Reserve Bank, mineral and energy environment, and from secret deals within intelligence sources, are now coming out in the open. Racist South Africa had been denied formal access to procure modern defence products from the European Economic Community after unilaterally declaring itself a republic in 1961. The country built a military fire power on the sly, and started its own defence industry with the help of engineers from the west. The new South Africa could not enter the international community of nations with this military backlog, they reasoned. Once a new democratic dispensation had set in, the market would become open to the procurement of new and modern defence products. The new government of national unity bit into this misleading concept of arms purchase priorities immediately after the general elections. They eschewed the bread and butter needs of the Azanian masses. Instead of considering a purchase from the United States of America – where public scrutiny would be intensive and debated in Congress – they chose to buy from the French, the Germans and the Scandinavians who were amenable to secret arms deals. The US had proscribed the South African defence industry and made some local captains of industry personas non grata, after its own technology, reproduced here and illegally sold to the belligerent Iraqi government, was utilised against them in the Gulf War in 1990. To deflect attention, the ANC and the Nats agreed to openly destroy the country nuclear capabilities. The point is that the ANC leadership is now holding the hot end of the stick in the arms deal they made with the advice and say so of the outgoing settler colonial regime. The sham commission of inquiry into the arms deal is meant to get rid of this albatross on their necks. The National Party leaders went away with the fat of the rewards from the dancing duo deal. Pik Botha, strategically appointed to the ministry of energy and minerals in 1994 government of national unity cabinet, oversaw the secret depletion of mineral reserves stockpiled during apartheid, and introduced commercially exploitative pricing methods in the petrochemical industries, for example. The old guard Nats surely enriched themselves from the proceeds of the deals. The new integrated intelligence organisations set up a special investigation unit to follow up on known individuals and organisations that siphoned state financial resources in the billions just before 1994. The unit was surreptitiously dismantled by the ANC government, and the intelligence report placed under lock and key. It has never seen the light of day. It is no wonder that the government has shoved in the so-called secrecy bill into law to protect their dastardly acts from being declassified and made public. However, lies and obfuscation have a tendency to resurface when least expected and to come out nakedly as in the moral of the story about emperor’s clothes. The public media has recently revealed that some big financial institutions, among them affiliates of the ABSA bank conglomerate, have had their long fingers in the vaults of the Reserve Bank exposed. All along they have been tjoepstil about this violation of good corporate governance, and silently enjoyed the ill gotten filthy lucre. We can draw an inference from this that this blatant criminality has been done with the blessings of the power that be. The National Party effectively collapsed its structures and joined the ranks of the African National Congress. Considering the massacre of mineworkers in Marikana last year, the daily upsurge of so-called service delivery protest in the slums where the underclass lives, it is safe to say the mythology of a new South Africa has reached its cul de sac. The Azanian masses have come to know that wool has been pulled over their eyes.